Val D’Isère offers legendary skiing in the French Alps. The ski region is now marketed as L’Espace Killy – one of the biggest ski regions anywhere including neighboring Tignes ski resort, honoring the famed French ski racer Jean Claude Killy. Linked together by multiple lifts, Val D’Isère Tignes offers skiers tons of terrain, high elevation skiing on two big glaciers, plenty of prepared (groomed) trail skiing, pus loads of high level off-piste terrain to explore. The two ski resort of Val D’Isere and Tigne couldn’t be more different, and their skiing has distinct variety as well. Val D’Isère skiing is vast and historic as well, as Val D’Isère hosted the Olympic downhill in 1992, and you can ski the steep long face of Bellevard dropping precipitously to the village, or explore the more mellow undulating fun ski flanks of Solaise and Vallons areas to skiers left. Tignes offers the highest alpine glacier skiing of Espace Killy on La Grand Motte, reached by a big super scenic tram, you can stay on the one prepared run down just admiring the amazing Alps scenery, or ski untracked off-piste natural snow in open bowls but be careful, this high alpine high risk terrain, we recommend you hire a guide to be on the safe side. Tignes’ Aiguille Percée is worth exploring, the ski landscape here is desert-like with the amazing rock formations surrounded by snow. Tignes also has plenty of terrain parks. 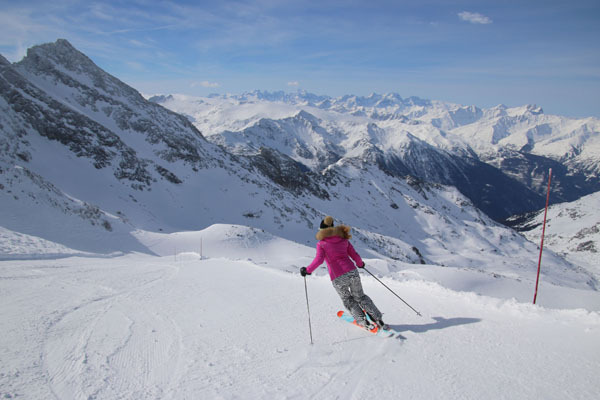 Val D’Isère has glacier skiing and some amazing off-piste runs too – including the Grand Vallon. The ski lifts at Tignes and Val D’Isère range from big trams and modern gondolas and couch-size chairs to older funiculars that tunnel up inside the mountain. The architecture of Val D’Isère and Tignes ski resorts are polar opposite. Val D’Isère is charming, a 13th century alpine village, right down to the old medieval steepled church. Classic wood chalets, old and new, line the village streets leading to Val D’Isère’s pubs, ski shops and chic boutiques, and a few five star hotels. Tignes meanwhile is not so historic or harmonious, it seems like the ski village was quickly constructed for the 1992 Olympics, the condo style bunkers are no longer modern looking. So we recommend you stay in the more authentic ski village of Val D’Isere, since you can easily ski back and forth from both. The après ski at Val D’Isère at La Folie Douce is wild, not a family scene however. In the village of Val D’Isère there are plenty of great shops, and pubs, Moris’ if you need an English fix for example. For an authentic Savoyard dinner of Raclette or Fondue, go to Les Corniches, or for more traditional plates – Les Cinq Freres.